Some of you who follow me on Instagram may know that I play Pokémon a LOT and am a huge fan. 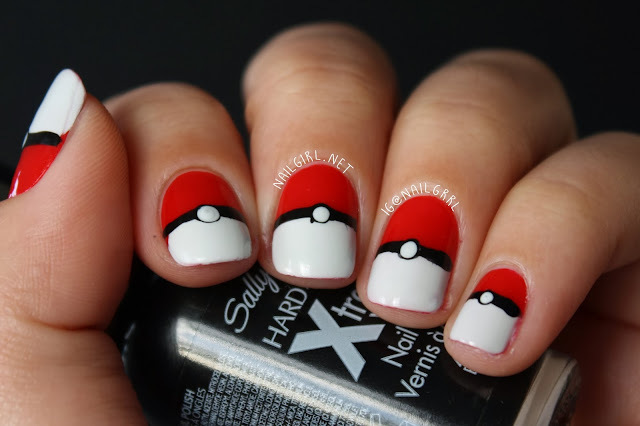 So, I have done some really fun Poké Ball nails to commemorate the release of Pokémon X & Y this October 12th! 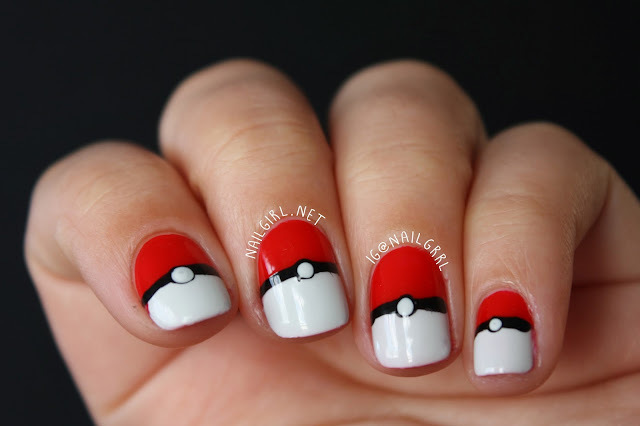 I'm really happy how these have turned out as my first attempt at Poké Ball nails was terrible. These are not perfect but I love them anyways! I've also included a tutorial so you can have a crack at these too! I used Zoya Sooki (thanks, Anneke! ), Sally Hansen Black Out, and OPI My Boyfriend Scales Walls. Tutorial time! You'll need a striping brush, a double ended dotting tool (or two! 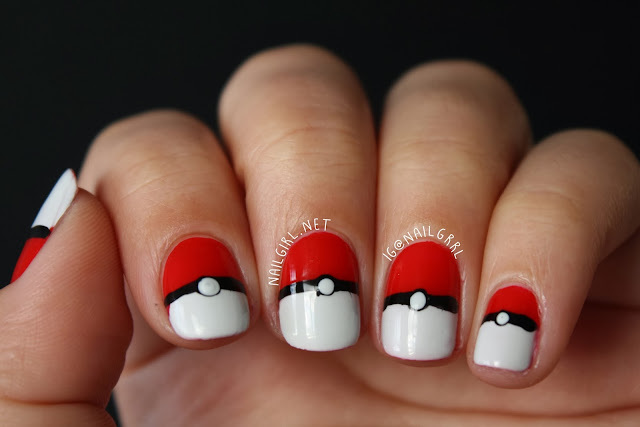 ), red, black and white polish. Remember that it's best to wait a few minutes between steps to get the best result! 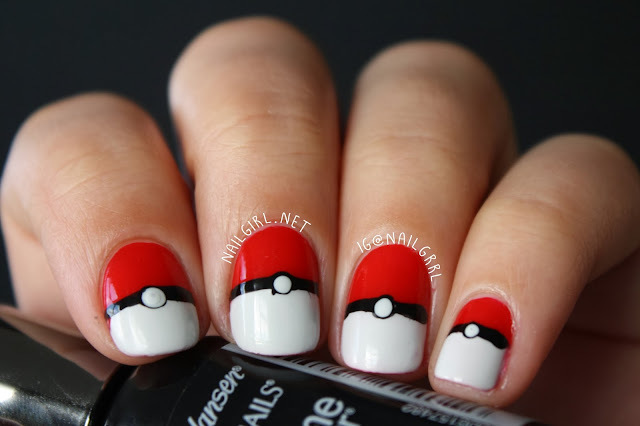 1) Paint a coat of your red polish, and let dry for a few minutes. 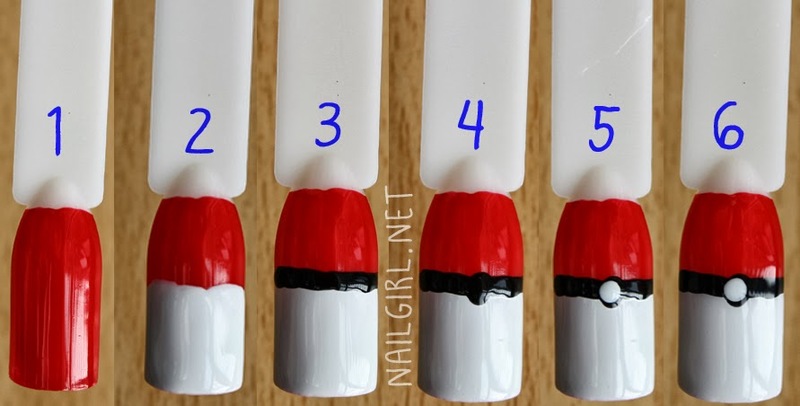 If you don't wait, your Poké Ball will be pink on the bottom instead of white! 2) Paint 1 or 2 coats of your white polish, starting from halfway on the nail. It's okay if this is a little bit messy, as it will be covered by the next step. 3) Using your striping brush and black polish, carefully paint a line across your nail. 4) Using the larger end of your dotting tool, place a black dot in the approximate middle of the black line you just drew. 5) Place a slightly smaller white dot in the black dot you placed to create the Poké Ball 'button'. 6) Top coat your nail with a high gloss, fast drying top coat to seal in the design! I STRONGLY advise waiting for 5+ minutes before topcoating to prevent smearing your hard work. I hope you enjoyed my very first tutorial as well as my first freehand nail art! Let me know what you think in the comments. aw man I wish I thought to do this for work today! 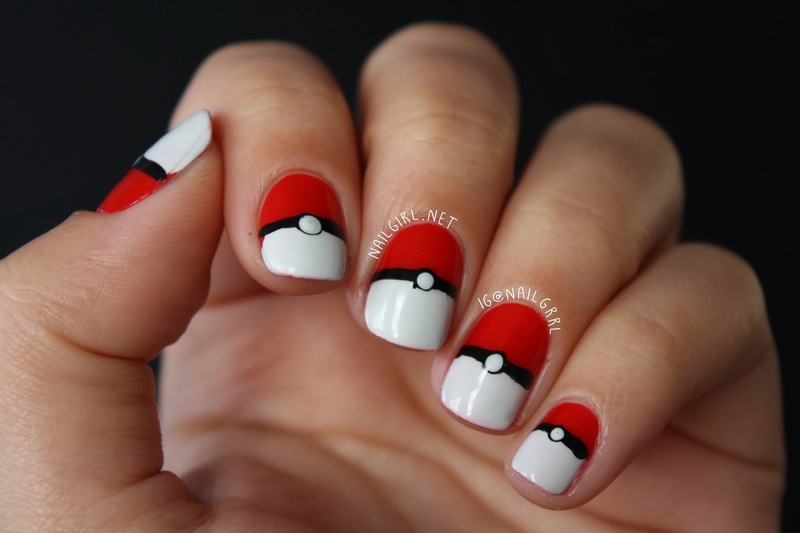 Awesome poke balls! I'm debating whether or not to get Pokemon Y or X. I still haven't finished Pokemon White! It's soooo good! I definitely recommend it!